Photos by Gold Line Foothill Extension. Click to see larger. Officials, including Metro Board Member John Fasana, watch the art being installed. Check out the new art at the Duarte/City of Hope Station for the Metro Gold Line Foothill Extension project. Pics of the art being installed last week are above and fact sheets below on the art. The carved limestone being installed atop the column represents the leatherwork often found on 19th-century saddles, a nod to the area’s ranching history. 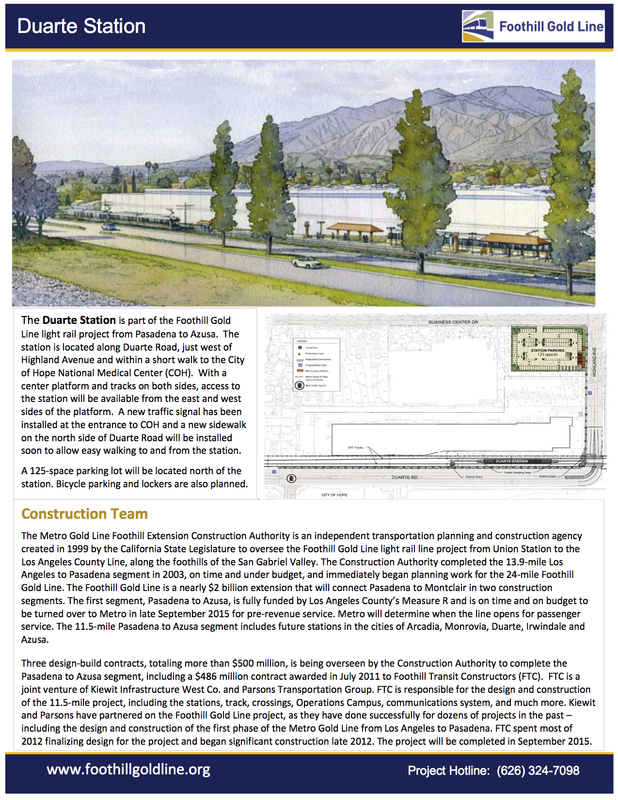 The 11.5-mile light rail project will extend the Gold Line from the Sierra Madre Villa Station in Pasadena to the Azusa/Glendora border and include six new stations in Arcadia, Monrovia, Duarte, Irwindale and two in Azusa (downtown and Citrus College). The project is funded largely by the Measure R half-cent sales tax approved by Los Angeles County voters in 2008. It is scheduled to open in the first half of 2016. Click above and below to see larger. I trust that the artists and METRO have sort and received the approval of the Tongva People for the use of their “traditional weave patterns” because for many Native Americans, their artistic patterns are sacred religious symbols and can only be properly reproduced by them or with their permission. Incidentally, did anyone pay the Tongva for the right-of-way? I’ve never heard of replicating weave patterns requiring any kind of license from anyone. That said, I understand that some people have nothing to do but think of critical comments on every single thing they read on the internet. This is a cultural and religious issue not a personal one. My family has strong ties with the Native American Peoples, and I feel that METRO has a moral obligation to explore the propriety of using Native American (religious) symbolism before using it as decoration. 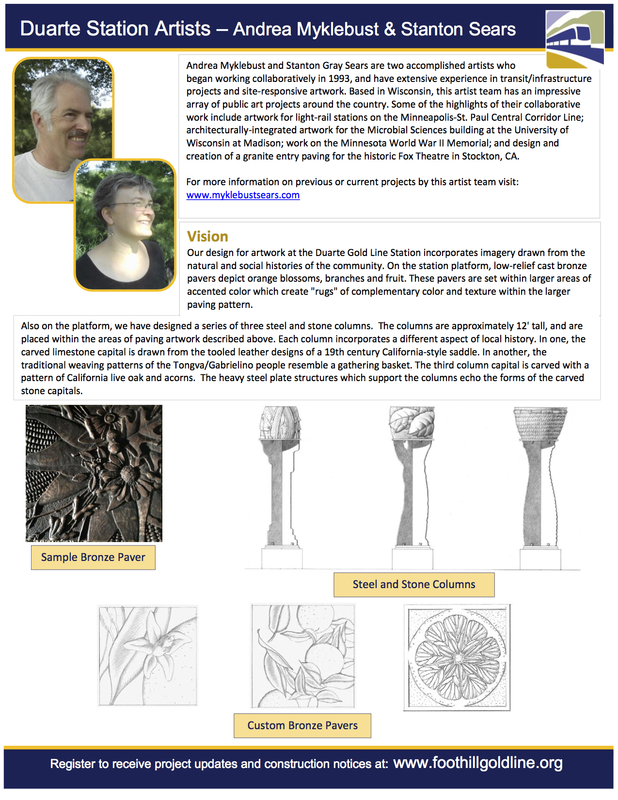 I speak as a practicing artist and as a life-time credentialed college art instructor. It is also my opinion that METRO’s artist vendors are equally obliged to research the propriety of using Native American symbols for profit. The reproduction for profit of Native American artistic iconography by non-Native Americans is governed by Federal law and I am sure METRO’s lawyers will agree. Finally, METRO’s personal attacks only reinforces its already arbitrary reputation with its stakeholders. Technically, Metro isn’t in it for profit. If Metro were profitable, it wouldn’t be asking the people for tax dollars to keep it running. It has not ever, made any sort of profit in running transit or through sales of Metro related merchandise. Said money made from selling promotional items are at best, additional revenue which only fills in their cost of operations. Your beef is with them, not anyone employed by LACMTA. I think the new designs look nice! Keep the progress going Metro! Will the new stations along the Gold Line Foothill extension each have their own artistic design? Or will each station be similar to the other stations? I’ve read a wide range of pro and con comments about the oringial stations’ artistic dsiplays between Union and Sierra Madre. I can’t recall if the stations between Union and the East LA look identical or if they are unique. Each station will have unique art, and some more info can be found here. The stations on the East LA end of things also have unique art, and more info on that can be found under the station art tab.